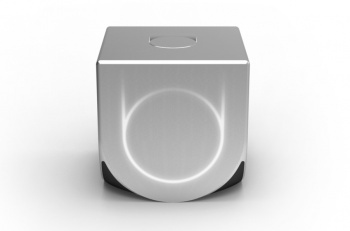 The Ouya will be the most portable console yet. People are clearly excited for the Ouya, as seen by these 42,000 backers and their 5.4 million dollars. While the funding itself has been incredibly successful, it's very easy to forget that the Ouya is still in the very early stages of development, and the hardware may not resemble the console pictured to the right. Details are slowly being revealed by the Ouya team, most recently and notably the console's size. The Ouya is looking to be the smallest console yet, more portable than even the Gamecube, sitting at no more than a few inches wide. "Our console is quite small," designer Yves BÃ©har said during a live Q&A on Kotaku, "around the size of a Rubik's cube, and so it will easily fit anywhere in a room, or be easy to throw in a backpack." Despite the small size, the console will require a significant amount of power to run on 1080p HD televisions as promised. With a planned Tegra 3 Quad-Core Processor, 1GB of memory, and 8GB of storage fitting into a three-inch margin, the Ouya will need to be efficiently designed to prevent overheating. BÃ©har assured backers that these factors are being taken into consideration. "We intend to give the Tegra chipset room to breathe, as obviously it does get warm. Airflow is important here." Now that the excitement over the open-source console is winding down, gritty development details like this are going to become more and more important. After all, the Ouya isn't the first gaming project to start out strong with millions of dollars behind it, and those millions never guarantee success. That said, if the Ouya can actually stand out as a unique, well-designed gaming platform, the small size would be a huge benefit. After repeatedly packing my own consoles into multiple bags when visiting my friends, being able to pick up an entire console and gaming library in one hand would be a refreshing change of pace.